January 2018 – Teach. Brian. Teach. Second semester physics for us includes topics like waves, optics, electricity and magnetism. With this in mind, I’ve been trying to organize my thinking about how the content is different through a lens that isn’t focused on topics, but rather on the shifts in thinking and skills required. 1. 2nd semester has more and more varied non-linear relationships, including more relationships that have non-monotonic or asymptotic behavior. These include, sinusoidal behavior, exponential behavior, Inverse square laws, and whatever the heck the Thin lens equation is. 2. 2nd semester has more focus on describing how behavior changes over space (potential or fields), whereas first semester has more focus on behavior changing in time. Thinking in wavelengths also becomes crucial. We more strongly employ a landscape metaphor for talking about concepts like potential and potential energy. We shift from vectors to vector fields. 3. 2nd semester has more of a focus on properties of media (index of refraction) and space (permittivity of free space) rather than particles (mass) and objects (density, volume, moment of inertia). 4. 2nd semester has a focus on energy flow (transport) across systems, whereas first semester is more focused on energy transformations within a system. This is reflected in need for concepts like wave speed and intensity. Even how we think about power subtly shifts from the rate of energy changes to rates of energy arrivals and departures. 5. 2nd semester has a focus on local conservation laws, whereas first semester relies more on global conservation. This is a result of focusing on flow. 6. 2nd semester has shifts from single variable functions to multi-variable functions. This is most obvious to me with waves. There also just seem to be more interdependent things going on–circuits. 7. 2nd semester has shift from 1D and 2D geometries to 3D, with examples including spherical waves, Coulomb’s law, magnetic fields and flux. The more complex geometries and focus on behavior over space are at heart of interference. Visualization becomes critical. 9. There is a proliferation of new units and unit combinations: Watts (J/s), Coulomb, Volts (J/C), Ampere (C/s), Tesla, Weber, V/m = N/c, eV, Ohms (V/A). Last semester I really noticed how much cognitive demand this placed on students and designed more activities to help us build fluency, familiarity, and connectivity. 10. There’s also a ratcheting up of the instrumentation needed to conduct investigations, diffraction gratings, multi-meters, oscilloscopes, etc. this is incomplete, but I wanted to start getting a record of some of my thinking. Be an Advocate for the Field: I have found it important to think of myself as a front-line representative of the entire field of PER, especially research-based teaching and learning of physics. From this perspective, it helps to fill in the gaps of your familiarity with curriculum and instructional strategies that were beyond your range of first contact as a researcher. Maybe you were really familiar with UW Tutorials, or modeling, or ISLE, or SCALE-UP, or PET or learning assistants, or studio physics, or whatever… now you need to be a knowledge resource and even advocate for all of this and more. For me, as a graduate student and postdoc I was more concerned with filling in gaps in my knowledge of research theory and methodology, and it took a fair amount of effort and time to fill in gaps of my knowledge of curriculum. Also as a graduate student, I was trained to be productively critical of physics education research, and to talk in ways that represented that. As an advocate for the entire field, you need to learn to talk as a bit more as an advocate than a critic. Treat your Non-PER colleagues as experts on teaching–whether its the teaching of their courses, or their students, the departmental curriculum, whatever. Proactively seek out their advice, knowledge, and opinions, even if some or a lot of they say disagrees with your little PER heart. They have a wealth of experience and knowledge to draw from, and some of it will be spot on. A lot of what is spot on will be based on experiences you don’t yet have, or on knowledge specific to your setting and students / curriculum. Try out some of the things they suggest. If it works, let them know. If it doesn’t, say, “Hey I tried that thing you suggested, but it didn’t work. Can you tell me more about how you make it work?” Treating them like a trusted, knowledge colleague on teaching makes it much more likely that they will reciprocate. Make Amends when you Act out as a Jerk about Teaching: At some point, likely more than once, you will be a jerk about something education related. When you recognize it, let people know you are sorry and make amends. This can happen in all kinds of ways, and it’s important to recognize when you have trampled on someone for the wrong reasons. Be a Point of Contact for PER Resources: When colleagues finally do come to you for advice on teaching, don’t moralize or pontificate. Instead, be a provider of resources. Be the advocate for the field of PER and point them to resources that you think are closely related to their question, concern, or issue. Let them know that their concerns and questions are important. Share more of your own thinking later if they come back again to talk about, or as follow up. This blog can now be accessed at teachbrianteach.com (no need for the extra wordpress part). This also means there should be no ads. The old url should still work, so no need to change anything. This week, a lot of folks on twitter were discussing a paper in Physics Today by Natasha Holmes about the shortcomings of laboratory instruction. I’m not going to specifically get into the details of this paper here, but it was the stimulus for me writing this blog post. It’s a good read, and you should check it out if you haven’t. Anyway, based on my earliest experiences in Physics Education Research, I am not the least bit surprised that it is a typical outcome for most contexts of physics laboratory instruction to have little or no impact on student learning of physics content. Here’s an example from my very first research project while I was a graduate student at Arizona State University. Students in an introductory college physics course would take a traditional laboratory at ASU that was separate from lecture. Each week students collected data (often using vernier equipment) about a different physics topic, plotted various data, and verified that results were consistent with theory. One week after students completed any given lab, I administered a post-test of some sort, related to the topic. What I learned fairly quickly is that you didn’t need to be very tricky with your questions. Often the best ones literally just asked students to state back what they had observed in the lab. So the next week, the post-test survey I administered asked students to rank the time of flight for three experiments – ones that left the table with speeds v, 2v, and 3v. Some students got a slightly different version of the ranking tasks which was to compare the time of flight for landing at horizontal distances x, 2x, and 3x. The questions included drawings of the situation that basically mimicked their lab experiment. Usually about half of the students could correctly answer such questions after the lab. (Note: my experience with this data led me eventually to a more careful study of how students were answering these and other similar questions). Conclusion: If one week later, many students cannot remember the results of these types of labs, we probably don’t stand much of a chance of them learning, remembering, and being able to apply any underlying principles that the lab result was intended to support. Right? So, the truth is this. I actually do think that laboratory activities can play a supporting role in students’ understanding of concepts, including enhancing students’ ability to transfer those concepts to novel situations. That said, lab activities alone are pretty useless and irrelevant. What matters more is the broader context in which a lab resides, and even furthermore I would say its how students “frame” the role of lab in the broader context of their learning. So how might I judge whether a laboratory activity I’ve planned is playing a meaningful role in students’ learning? The most crucial thing I look for is what happens in the coming weeks. If we as a class never explicitly mention a lab during ongoing discussions–what we saw, what we concluded, or what it meant– that lab was likely meaningless. That’s it. That’s really my only criteria. I don’t mean the lab was inherently meaningless. I mean that our subsequent activity rendered that lab activity meaningless, retrospectively. In trying to improve things for future courses, it could be that I need to ditch the lab, or it could be I need to better plan for how that lab will be continuously rendered meaningful through subsequent activity, or I need to help with reframing lab. Lab activities I just do not think have any inherent value, just as activities of mining raw materials has no inherent value outside a broader activity. It’s what happens subsequently in a process that determines it’s value. On twitter recently, I tweeted about a Newton’s 2nd Law lab that I have adapted and refined over time, which is basically just a half-atwoods with force sensor on a cart and motion detector. In that lab, I deliberately have students in class take data using a 1.0 kg mass. A twitter friend of mine remarked that he might be worried that this could accidentally reinforce a misconception about how force and acceleration are related (i.e., F = a). I agreed that this seems like a possible outcome, but perhaps only if you are looking at this lab in isolation and expecting students to “discover”, “abstract”, or “generalize” the correct ideas from it. But that’s not how I look at this lab (or most labs), I look at this lab as something designed for talking about later, to uncover its meaning through subsequent activity. Specifically, I aim for students to start thinking of net force as meaning something like, “It’s the kind of (collective) forcing that would cause a 1.0 kg object to accelerate at the same value.” We expand from that specific lab by thinking about data / experiments for objects that are heavier and lighter with in-class clicker questions and post lab questions. But most importantly, it’s something I try to work into lessons during every single day in following weeks while we solve force problems. If I am doing an example problem, I won’t merely use the equation Fnet = ma. Instead, I will calculate Fnet and talk about what that means for a 1.0 kg object, what that should mean for our actual object, and figure out exact values using proportional reasoning. If I want to be really explicit, I might make an acceleration vs. force graph similar to lab. Similarly, when students are working problems at whiteboard, I expect students to always explicitly determine a net force value, and I ask questions about what that means, for a 1.0 kg object, for their actual object, and often other masses. I ask, how do they know? Why does it make sense? What observations have we made that support that way of thinking about how objects respond to forces? 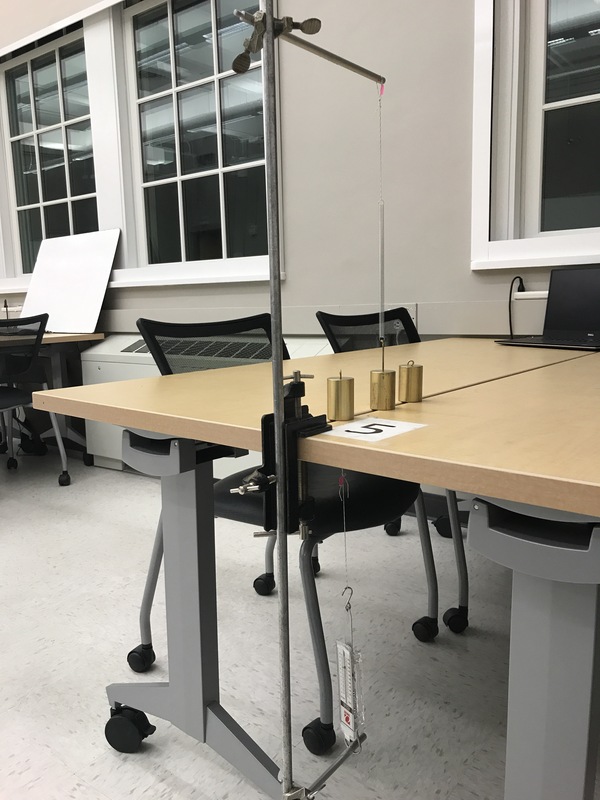 Friction Lab: I have also developed some friction stations that I think are a pretty decent introduction to the topic, but again, the question isn’t if a lab is good or bad by itself. One of things I expect out of this lab is for students to spontaneously bring up stations from that lab when we get stuck on a problem or a clicker question about friction. One clicker question in particular where I see this happening is about pulling objects at angles along rough surfaces. The particular clicker asks students how the angle of the pull might affect how easily the object budges. In this clicker question, there are certain lab activities I am looking for students to reference during discussion, including observations about normal force,observations about the effect of normal force on friction, and observations about angled vectors and components. How do you get students to treat labs as activities relevant to future discussion? (Spoiler: treat them as if they are actually relevant to future discussions and plan for later activities that are designed to make use of that relevance). So, I don’t think there is one answer to this, but you certainly don’t just hope it happens. Here are three concrete things you can do to help support it, but there are many more. Make sure that laboratory activities are meaningful to prior discussions. 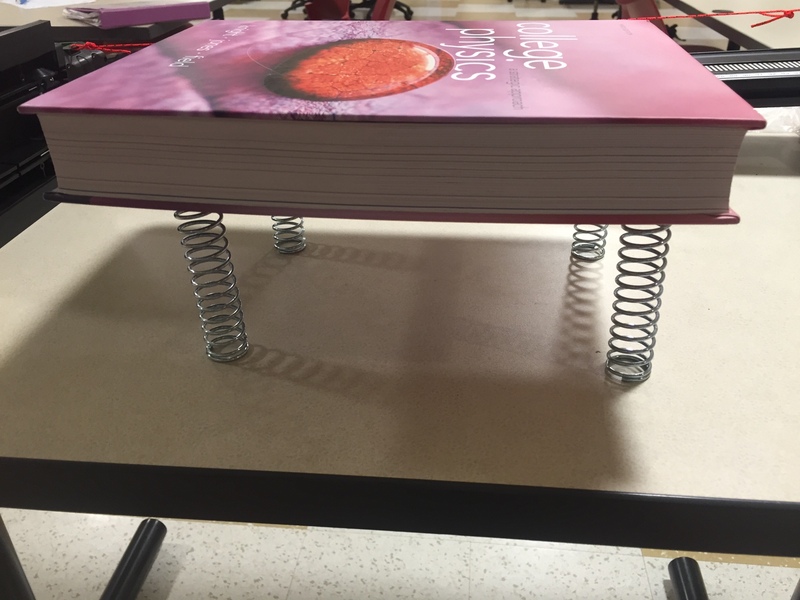 Many times students don’t know why they are doing a particular lab, or how it’s connected to their prior learning. By making sure students have a sense of purpose and connectedness with lab before hand, this makes them more likely to extend that connectedness in the future. Some of the ways I do this are following: using clicker questions to raise an issue (scroll to end of this post to see an example from forces), using demos to establish a tentative result and present a challenge (Newton’s 3rd Law), or sequencing questions, activities, and discussions that help us refine an understanding through observation and testing (circular motion). It’s a good sign when students can say why they are doing something and/or what they are trying to figure out. Ask questions, use prompts, and phrases that imply connectedness and expansiveness. (What will you want to remember about this lab tomorrow?, How is your answer to this question supported by what we observed earlier today? How is this result similar or different than what we saw before? How does this observation change your thinking about? How does this outcome influence our answer to the question of ___? What ideas from today’s lab will be helpful when you go to ___ ? ). If you are interested in this more, see this paper about expansive framing and transfer.